Thailand's embattled premier Abhisit Vejjajiva said Thursday the lower house of parliament will be dissolved in September, paving the way for November polls in a bid to end a crippling political crisis. Thailand's anti-government "Red Shirts", who have been waging a campaign of protests to force snap elections, have signed up to Abhisit's reconciliation "roadmap" which envisages holding national polls on November 14. 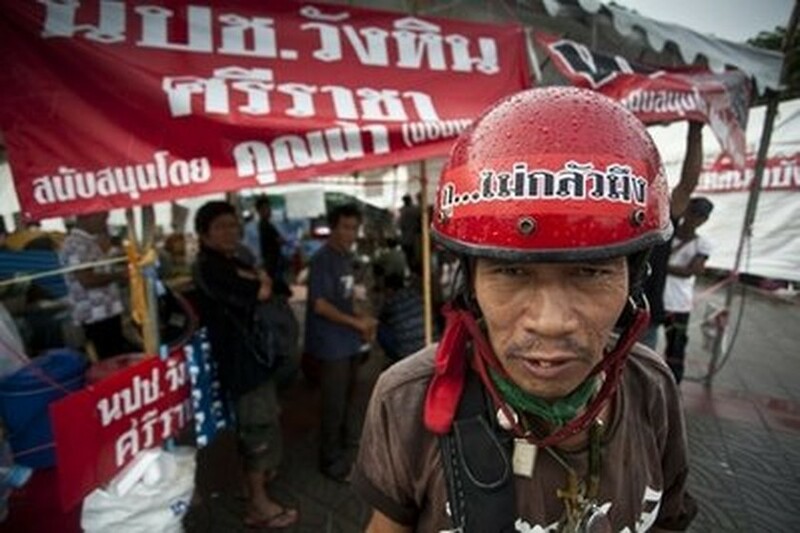 But after a long and bitter standoff, marred by outbreaks of violence that left 27 dead and hundreds injured last month, they remain suspicious and want more details before leaving their vast protest encampment in central Bangkok. "Everybody can calculate the date," Abhisit said when asked to specify the timing of the dissolution, which the Reds are demanding before they end the rallies that have paralysed the retail heart of the capital. Asked whether it would happen during the September 15-30 timeframe given by one of his allies, Abhisit replied: "Yes". Lawmakers from his ruling Democrat Party were holding talks in parliament Thursday to refine the reconciliation process and discuss the dissolution date. Top Red Shirts have voiced optimism that the end is in sight for their supporters at the encampment, which is fortified behind makeshift barricades made of piles of kerosene-soaked tyres, razor wire and bamboo stakes. One Reds leader, Weng Tojirakarn, told supporters to remain on their guard, accusing the Democrats of having backtracked on promises in the past. "But it doesn't mean that we won't join the reconciliation roadmap. That's the resolution we have made by consensus and we will definitely take part," Weng told protesters Thursday. "But we do not trust the Democrats and Abhisit," he said. Crowds at the vast Reds camp -- mostly rural poor from Thailand's impoverished north, or urban working class -- have swelled to as high as 100,000 in the past, but numbers have steadily fallen. Many protesters, however, remain resolute despite the mounting piles of garbage, and the start of the rainy season which has made life hard for those sleeping rough under flimsy shelters. The Reds, mostly supporters of billionaire former premier Thaksin Shinawatra who was unseated in a 2006 coup, have been campaigning for snap elections to unseat Abhisit's government. They condemn the administration as undemocratic because it was appointed with the backing of the army in a 2008 parliamentary vote, after a court ruling ousted Thaksin's elected allies. Abhisit said in a national address Monday that he was ready to hold elections on November 14 if all parties accepted his reconciliation plan and dropped their demand for immediate polls. Sirichoke Sopa, a Democrats lawmaker seen as close to the premier, accused the Reds of nit-picking by insisting on a dissolution date and said that security forces remained on standby to clear the rally by force if necessary. He said Wednesday that the dissolution would fall between September 15-30, under laws that mandate a 45-60 day election campaign. The Reds have said the government is intent on clinging to power until September to ensure the new army leadership line-up is appointed and the national budget is approved in parliament before it holds elections. Thaksin, a telecoms tycoon-turned-politician who lives overseas to avoid a jail term for corruption, had at one point been galvanising the Reds nightly by video addresses, but has now called on the rivals to settle their differences.